Caloundra power boat club is a stunning location overlooking the water. 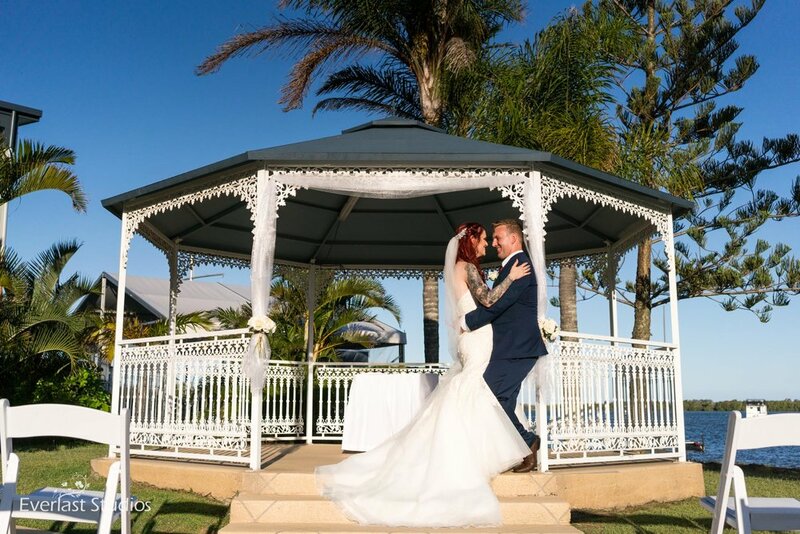 Everything is in one spot so a great location for your wedding ceremony outside under the gazebo, followed by your reception upstairs in their beautiful function room. Cassie and Joel did just that. They were married in January with their ceremony starting at 3pm. Guests arrived early and waited in the cool of the trees for the ceremony to start. Joel and the groomsmen arrived in a Mustang, had a few quick photos and then Cassie and the girls arrived right on time. They were married under the wedding gazebo by Celebrant, Natasha Hill. They had their own personal vows which were really beautiful. After the ceremony we did a group photo on the lawn of the Caloundra Power Boat Club and then we went for a walk with the bridal party for some photos of the bridal party and of course with just the bride and groom. We had about an hour for a photoshoot before heading into the reception at the Caloundra Power Boat Club. It was such a beautiful day, the staff at the venue were fantastic and really helpful.